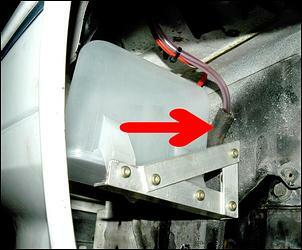 An intercooler water spray is one of the cheapest and easiest ways of improving intercooler efficiency. By spraying a fine mist of small water droplets over the intercooler core, heat is removed from it through the evaporation of the water. Effectively, it's like evaporative air-conditioning for your intercooler. To achieve small droplets you need to use both a high quality nozzle and a high pressure pump. The triggering of the spray is best done with an intelligent intercooler spray controller, that (for example) measures ambient and intercooler core temperatures, and also detects engine load. In past AutoSpeed stories we have gone into these areas in lots of detail (see "Intelligent Intercooler Water Spray - Part 1") and so in this story we'll concentrate just on the physical fitment of the parts. 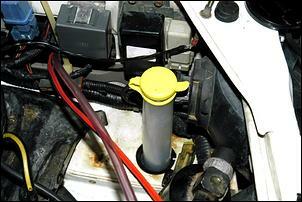 The water reservoir and pump that we decided to use are based around Holden/VDO parts. The parts are available from the AutoSpeed shop ("AutoSpeed Pump and Grommet") or from a Holden dealer and were selected on the basis of their low cost, the pump's proven durability and high output pressure, and the reasonable volume of water held by the reservoir. It is strongly suggested that if you use a different windscreen washer pump that you test its pressure - some pumps are quite poor in this regard when working with a good nozzle. The first step in the install process is deciding where to mount the reservoir. 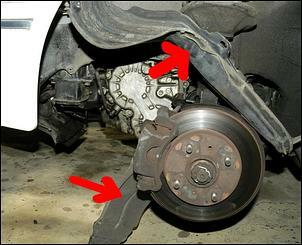 It's designed to be located in the inner guard (the fender) in front of the wheel. Many cars have quite a lot of unused space hidden behind the guard liner. 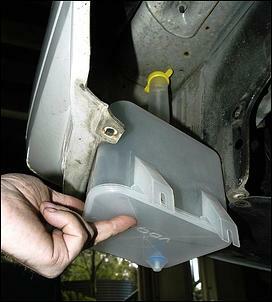 However, it is vital that you check first - some cars also already have in this space water reservoirs, intake resonant boxes, vacuum reservoirs - even emissions canisters. Our guinea pig was a 1988 Nissan Maxima turbo. To check out the available space you'll usually need to take off a front wheel and remove some of the guard liner fasteners, allowing it to be pulled back for an inspection. Here two liners were loosened. Where will the neck come through? Can the three mounting tabs on the reservoir be connected to secure, strong brackets or existing panels? Is there clearance room for the pump hose? Will the reservoir intrude into the wheel area? - especially on full steering lock, wheels can need more room than is first obvious. Finally, will the guard liner fit back on? In this case a fairly substantial bracket was going to need to be made to support the two rearmost mounting tabs, while the front one could be bolted straight to the panel. If you can cut the hole from above it's more straightforward and saves you getting metal filings falling on your face. 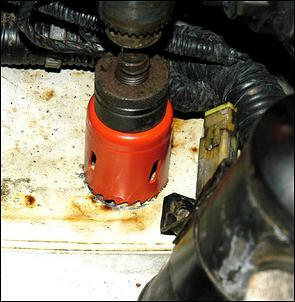 Lubricate the holesaw with copious quantities of a spray penetrant like WD40. This saves the teeth of the saw and also eases the cut. 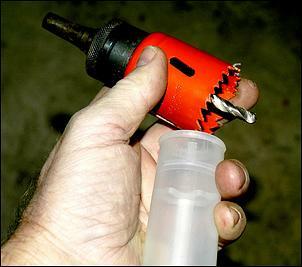 Drill at the slowest speed possible, and stop occasionally to let the saw cool. Once the hole has been cut, coat the raw metal edge with some paint and then cover the perimeter of the hole with same rubber edging. If you don't have any edging, cut a longitudinal slit in some small diameter vacuum hose and use that instead. 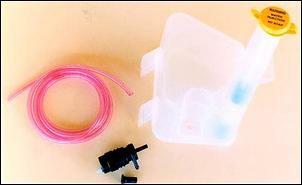 However, before you get too far with the reservoir and pump installation, make sure that you attach the wiring and tube - the pump may not be very accessible when the system is installed. 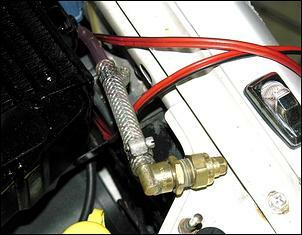 Here the wiring was soldered directly to the pump terminals, using heavy duty cable. Heatshrink was then placed over the terminals (you can't see it because it's clear). The plastic tube is a tight fit, so use a heatgun or hot water to soften it before pushing it on the pump's barbed fitting. 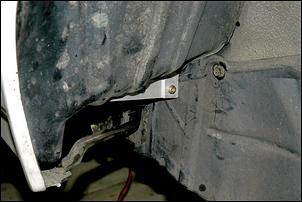 The major job in installing the water reservoir on the Maxima was making the rear bracket. 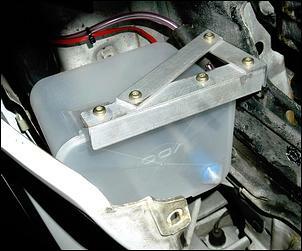 Because the reservoir can hold about 2 litres of water it can weigh in excess of 2kg - so the brackets need to be good. 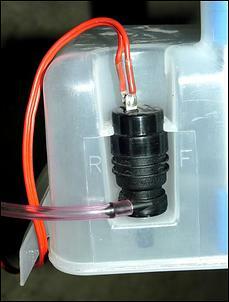 Don't be swayed by how light the reservoir and pump combination is when empty! The bracket was made from strong aluminium angle. Although it looks like a 90-degree bracket, in fact the shape of the inner guard metalwork meant that the bracket is probably more like 75 or 80 degrees. The correct angle was found by trial and error and then when it was right, the strengthening diagonal was made, the holes for it drilled and then it was bolted into place. The bracket is very strong. Where the plastic tube from the pump came in contact with the bracket, the tube was protected with a piece of larger diameter rubber hose (arrowed) that was slipped over the water supply hose. Both the wiring and the hose were cable-tied in place to stop them flopping around. While the rear bracket provides nearly all the support for the reservoir, remember that the front mounting tab is also well secured, being bolted to the panel through which the neck protrudes. A small cut-out had to be made in the guard liner to clear the bracket - if it was required that the bracket be nearly invisible, it could be painted black with a spray can. Incidentally, the fancy Torx fasteners weren't used to look trick, but simply because I once bought a huge number of them and I like to use them up! Here's what the filler neck looks like from inside the engine bay before the intercooler was installed. Selecting the correct nozzle is very important if the finished spray is to perform well. We used the Spraying Systems Conejet nozzle, a precision brass design. 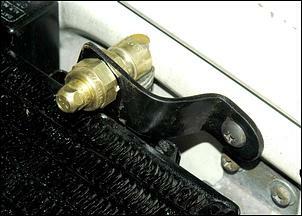 (This nozzle is available from the AutoSpeed shop - "AutoSpeed Spray Nozzle Kit".) In addition, a filter/check-valve (which keeps crud from blocking the nozzle and stops the nozzle dripping if it's mounted below the water level) was placed behind the nozzle. This was teamed with a right-angle fitting which also required a change in hose diameter. The requirement to use a high quality nozzle and a high pressure pump cannot be stressed enough. The droplet size must be small if the spray is to be as effective as possible. Most spray nozzles do not produce small droplets. And so why is this important? Well, imagine standing downwind of a water spray. If it's a fine mist, you'll be cooled very effectively; if it's a hose producing huge droplets, the evaporative cooling will be nearly zero. Technically, small droplets give a much better surface area to volume ratio - and that's a key parameter in determining the speed with which evaporation will occur. Evaporative airconditioners used in hot, dry climates can be extraordinarily effective at lowering air temperatures - and they are so good at evaporating water that almost no droplets make their way inside the premises being cooled. 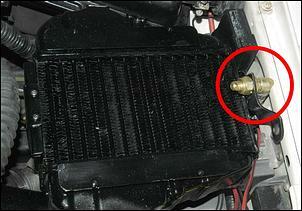 The nozzle was placed at one end of the intercooler. Its spray range is constrained by the foam rubber surround which clamps down around the edges of the intercooler when the bonnet is shut. A small cut-out in the foam is provided to allow clearance for the nozzle. Taking this approach ensures that all water added by the sprayer must pass through the intercooler core or be evaporated - there are no other escape routes. The best approach to operating the spray is to use the AutoSpeed Intelligent Intercooler Water Spray Controller, available from our shop at "Intelligent Intercooler Water Spray Controller Module (BOXED)". This device really does give the best combination of saving water, cooling the core and picking exactly when the spray is necessary. However in this budget job a simple dash-mounted switch was used instead. The switch simultaneously triggers a below-intercooler fan, ensuring that there's always plenty of airflow when the spray is running - even with the car stationary. In my application, where I live on top of a mountain and am often stuck behind slow-moving traffic, the spray is a great addition. When there is insufficient airflow (because of the slow vehicle speed) but the car is on boost (because of the steep hill), I can switch on the spray knowing that the intake air temps will then fall. Effective, simple and cheap. Perfect!